(St. Catharines, ON) Canada’s Sr. Men’s Wheelchair Basketball team held their final training camp on Canadian soil prior to the London 2012 Paralympics at Brock University in St. Catharines, ON, where they hosted Team USA in a three game Pre-Paralympic Test Series July 16, 17, and 18. Despite dropping the first two games of the series by scores of 67-61 and 58-50, Canada saved their best performance for last, defeating Team USA 70-56 in the final game of the Test Series. Patrick Anderson led the way for Canada, scoring 37 points – the highest single-game point total for any player in the tournament. Abdi Dini chipped in with 8 points, while Bo Hedges added 6 in the win. USA’s Matt Scott scored 16 points in the losing effort, while Will Waller and Jason Nelms each added 10 points apiece. Not only a possible London medal round preview, the Test Series served as a re-match of the 2008 Bejing Paralympics double-overtime thriller, in which Canada beat the USA in the semi-finals of the tournament. Canada went on to win silver in Beijing, while USA dropped to 5th place. 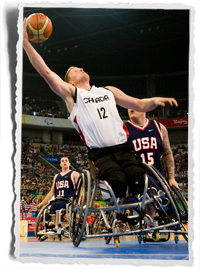 The Beijing semi-final is widely regarded as one of the greatest matches in Canadian wheelchair basketball history. Canada heads to London hungry for its third Paralympic gold and record-setting fourth-consecutive podium finish, following back-to-back gold in 2000 and 2004 and silver in 2008. Team Canada is bolstered by the return of (Fergus, ON), widely considered to be the top player in the world, and 11 returning players, nine of whom have Paralympic experience. Seasoned veterans Dave Durepos (Fredericton, NB), Joey Johnson (Winnipeg, MB) and Richard Peter (Vancouver, BC) will tie a Canadian record by competing in their fifth Paralympic Games in London. It will be the first Paralympic Games for Brandon Wagner (Burlington, ON), Chad Jassman (Calgary, ON) and Tyler Miller (Kitchener, ON). Team Canada will depart August 14th for a final tune-up tournament in the Netherlands, with games held August 16-19 against Turkey, Germany, and their hosts, the Netherlands. They will then travel to Sheffield, England for a small training camp August 20-24, before moving into the London Paralympic Village. Paralympic competition starts for the Sr. Men on August 30th against Japan at 1:00pm BST. The Senior Men’s National Team is amongst the top wheelchair basketball teams in the world. The Canadian Men are the defending silver medallists from the 2008 Beijing Paralympic Games. They won back-to-back Paralympic gold medals in 2000 and 2004, and have reached the podium at five of the last six World Championships.